Mitsubishi, these days, is a floundering automaker lost in a sea of rivals and competitors who continue to innovate their products and grow year after year. None of their cars are relevant or inspiring anymore, so you figure they’re probably better off focusing their efforts on making TVs (or something else) instead. That’s not to say that they haven’t made an impact in this world, though. Their greatest contribution? (Please don’t say Eclipse.) None other than the Lancer Evolution. The tenth and final iteration of the Evolution has come and gone, with the send-off “Final Edition” having ceased production in 2015. The Evolution X is truly one of the great performance bargains of all-time. Forced induction, all-wheel drive, and a lightning-fast steering setup are the key ingredients to this textbook boy racer. This is a car that begs you to play with it—literally a life-sized (and functional!) toy car. The ride is punishing, the interior is cheap and outdated, and it’s ugly to just about everybody outside of adolescent males (and myself)—all of which do not matter because they do not diminish the Evo’s fun-to-drive character. The FQ-400 is a special variant of the Evo X for the U.K. market. 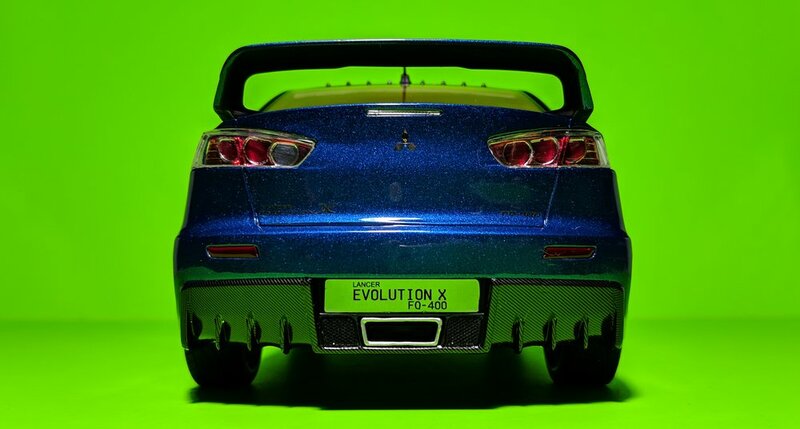 Since most owners like to modify their Evolutions anyway (when was the last time you saw a stock Evo? ), Mitsubishi went ahead and did it for them in this exclusive version. Consider it the evolution of the Evolution. With only a hundred units produced, this is a rare breed of Lancer. Both performance and visuals have been dramatically enhanced in the FQ-400. The enabler is the larger turbo in the FQ-400, which generates a not-insignificant power boost of a hundred horsepower over the standard Evo X. (If that’s not enough, there’s an even more limited version, called the FQ-440, which makes—you guessed it—440 horses.) 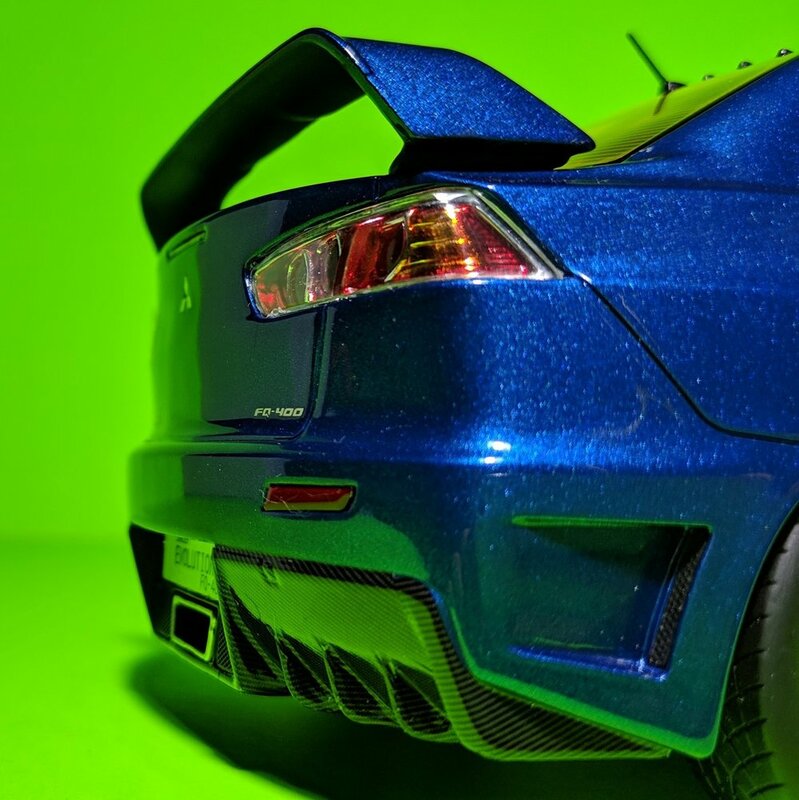 Visually, the Evo X’s signature scowl gets even nastier with a front splitter so sharp it can dismember pedestrians by the ankles and would probably not pass pedestrian impact regulations here in the U.S. anyways. There’s even an asymmetrical duct on its snot for added character. Throughout the car, there is an abundance of vents. Extra vents on the front clip. 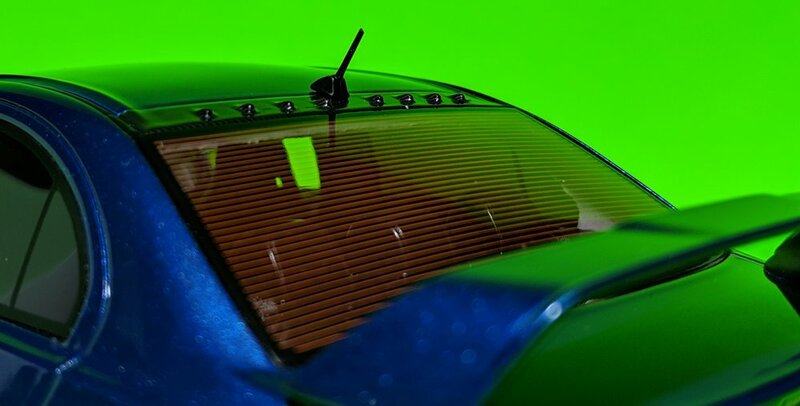 Larger vents on the hood. Vents on the skirts to direct airflow to the rear brakes and back out. And then there are the aerodynamic bits. I shouldn’t say bits, because that carbon-fiber rear diffuser is comically humongous for this souped-up econobox. You’ll find a similar set of fins on the roof, which Mitsubishi calls a “vortex generator”. Sure, why not? Whether all of this is actually functional or purely cosmetic is up for debate, but the FQ-400 is clearly the Evolution from hell. The only features I don’t like about this variant are the wheels, which look awkwardly tame compared to the rest of the modifications, but I’m sure they get the job done when it comes to unsprung mass and whatnot. 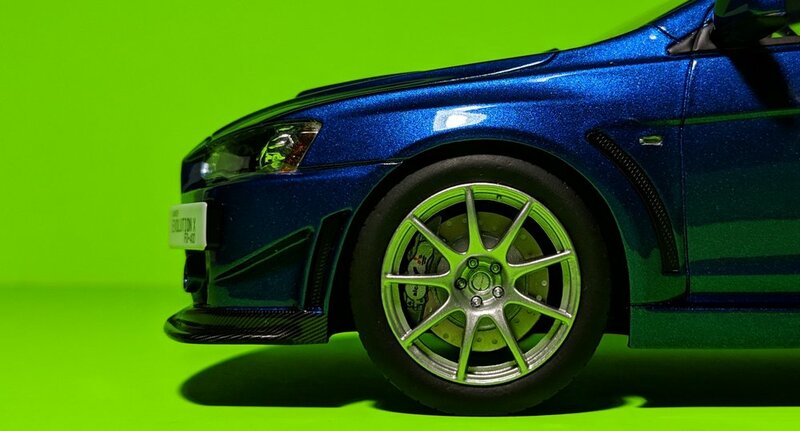 Introducing this unicorn Evo to the diecast world—it’s actually resin, but we can generalize here—is BM Creations, a brand you’ve never heard of and one that you are probably googling at this very moment. Getting this one was like a shot in the dark because there’s so little information about it. I decided to pick it up anyways because Ottomobile announced that they will be bringing the Evo 8 FQ-400 in May, and I wasn’t going to pass up the opportunity to eventually pair the two together. 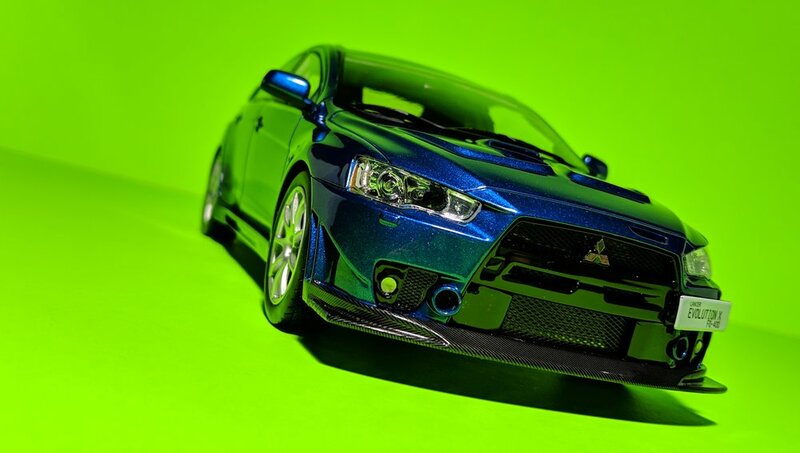 Available in two colors, red and blue, I chose the latter as I already have a Final Edition Evo X in red. Good call. With this patriotic pair right before my very eyes, I can now confirm that the Evo looks better in blue. The FQ-400 is the debut product for BM’s line of resin models, called Volcanic, and surpasses expectations when there were none in the first place. Sometimes you just know a model is a keeper the moment you lift it out of its protective styrofoam shell, and this is one of those. Set next to the Final Edition, which is more or less a regular Evo X with some extra badges, the FQ-400 steals away more of your attention with its visceral styling. The detailing is also superior to its Kyosho counterpart—its closest direct competitor—both of which cost about the same. The carbon-fiber exterior pieces stand out and have just the right amount of gloss for realism. The interior comes sans harnesses, but has all the other minutiae such as the legible buttons and dials, silver accenting trim, navigation display with map, and carbon-fiber headrests. For scale models, we have a four-letter magic word that is the be-all and end-all: mesh. So, while this Evo lacks any sort of underbody definition, it makes up for it with some neat engine components visible through the mesh vents, proving that a resin model can be more than just a plastic shell. If there’s one area that calls for immediate revision, it’s the ride height up front; a millimeter lower would be perfect. There are no glaring quality issues to speak of, so this Evo looks and feels very much on par with other high-end resin models. Not many people get it right on the first try, but BM Creations certainly has made a great first impression. Five stars for the “three-diamonds”. Mar 14, 2019 Chasing Cars: Fried Eggs! Feb 1, 2019 Chasing Cars: Godzilla! Jan 20, 2019 Chasing Cars: Clownshoe!